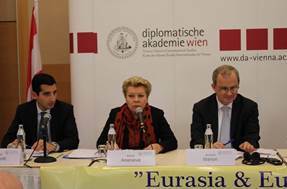 On October 30-31, 2015, at the Diplomatic Academy of Vienna, Austria, a Europe – Eurasia leadership conference was organized by UPF-Europe on the theme: “Europe & Eurasia Dialogue: Building Trust and Securing Cooperation for Sustainable Development”. 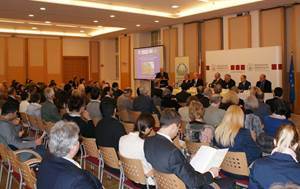 Attended by leading figures from the areas of politics, religion, business, academe and diplomacy, Europe – Eurasia leadership conferences began in 2012 in Moscow (“Peace and Security in Multicultural Societies”) and Vienna (“Europe and Russia – Partners in a Globalized World”). 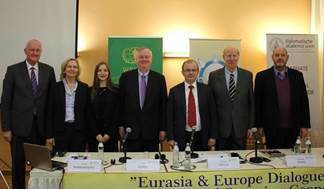 The series continued in 2013 in Paris (“Europe and Eurasia: Cooperating for a Culture of Peace and Human Development”) and in 2014 in Chisinau (“Eurasia - Europe Dialogue for Peace”). 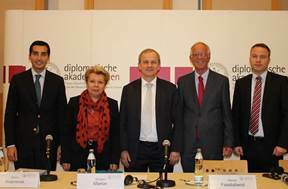 In February 2015 a panel discussion on “The Imperative of an EU–Russia strategic reset” was organized in Vienna. Alongside this year's celebrations marking the 70th anniversary of the United Nations, one significant milestone is the proclamation by the General Assembly of the Post 2015 Sustainable Development Goals. Cosponsors of the conference where the Women’s Federation for World Peace and the Academic Council on the United Nations System. 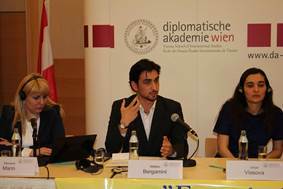 The conference was attended by over 150 participants: Ambassadors and members of the diplomatic corps, NGO leaders, UPF Peace Ambassadors and Youth volunteers, and students of the Diplomatic Academy of Vienna. 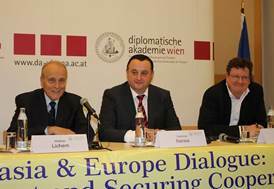 It focused on the need to re-set a strategy of cooperation between Europe and Russia to ensure peace and stability in the region and the world, and to engage the cultural and religious dimensions of dialogue for better mutual understanding and to complement political approaches to conflict resolution. It brought together a broad range of speakers from the realms of politics, academia, religion, and civil society, and concluded with a youth panel including students from Europe and Russia. 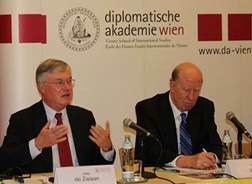 Ambassador Dr. Hans Winkler, the Director of the Diplomatic Academy of Vienna, welcomed participants and reminded the audience that the prestigious Academy, founded in1754, was the second institution in the world set up to train future diplomats after the Vatican’s Pontifical Ecclesiastical Academy. 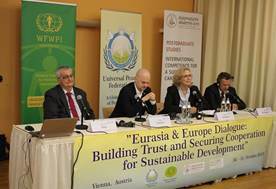 The first session, moderated by UPF-Austria President Peter Haider, had as a theme: “Europe & Russia: Resetting a strategy of cooperation for sustainable development”. Dr. Thomas Walsh, President of UPF International, who had just attended in Rome the 50-year anniversary celebration of the Vatican II declaration “Nostra Aetate” on the Relations of the Catholic Church with Non-Christian Religions, shared about the need today for any institution or organization to develop trust, cooperation, and solidarity beyond one’s own entity and identity. This is the essence of UPF’s mission, he said, describing the partnerships UPF was building with prominent organizations around the world. A soft power approach and dialogue build trust and foster prosperity and development, he said, declaring his full commitment to developing a dialogue with Russia. Dr. Sergey Ezhov, Head of Division at the First Department of CIS Countries at the Russian Ministry of Foreign Affairs, gave a presentation on the Eurasian Economic Union (EEU) that functions since January 1, 2015 with five current member nations: Armenia, Belarus, Kazakhstan, Kyrgyzstan and Russia. He reviewed its history, outlined its principles and goals, and explained the opportunities it offered for cooperation with the EU. Russia now has to deal with the EU in the framework of the EEU, he said, but Brussels’s lack of response to calls for cooperation incites Russia and other EEU nations to establish more cooperation agreements with Asia. Dr. Walter Schwimmer, former Secretary General of the Council of Europe (1999-2004), reminded the audience that Winston Churchill had raised the idea of the Council of Europe in 1943 during the war, already envisioning a united Europe beyond the conflict. But where is the vision today that initiated both the Council of Europe and the EU, he deplored. He insisted on unconditional ceasefire to stop the killing in Syria, and on unconditional dialogue between Europe and Russia, as such cooperation was in the best interests of each region. Examples of cooperation between China, Eurasia and Europe deserved more attention from the EU, in his view. He also deplored that NATO suspended the only tool of dialogue with Russia, the NATO-Russia Council, at the time of the Ukraine crisis. The EU and Russia yet need to develop a strategy and road map for their common future, he concluded. Dr. Vladimir Petrovsky, Project Manager at the Russian International Affairs Council, stated that problems in Europe-Russia relations, seen in the context of the Ukraine crisis, were in great part caused by misunderstanding and mistrust among the different parties. The EU overestimated agreements made with Eurasian nations under the Eastern Partnership, which contributed to the current crisis. Europe and Eurasia have a clear interest to cooperate and meet the challenges and opportunities raised by Asia’s export economies, he said, citing the ambitious Chinese project of the New Silk Road linking China with Eurasia and Europe, raising the possibility that Crimea could eventually become a major international economic hub. He pointed to Europe and Russia’s common security challenges such as conflicts in the Middle East or the refugee crisis, and reminded about the negative impact of sanctions for both the EU and Russia. Dr. Jaap de Zwaan, Lector on European integration at the Hague University of Applied Sciences and former Director of the Netherlands Institute of International Relations “Clingendael”, reviewed the missed opportunities of recent years in EU-Russia relations and called for a “bottom up” approach to reverse the frozen process of the Partnership and Cooperation Agreement between the two blocs. 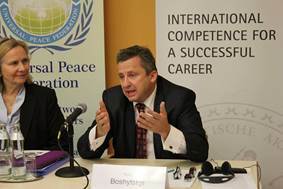 Let us start, he said, with a soft power, people to people approach – education, research, student exchanges, sports, etc.- then move to justice cooperation on issues such as trafficking or migrations, then turn to the foreign policy domain, including Ukraine, and last but not least, the economic domain that is full of potential. Indeed the major stumbling block is Ukraine, where various political solutions could be considered, but first solve human situations, he concluded, then political ones. 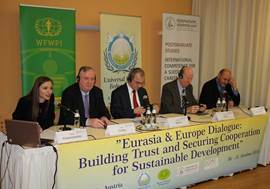 The second session, moderated by UPF-Europe Secretary General Jacques Marion, was on the theme of “Europe and Eurasia: Toward a Partnership for Peace and Stability”. Dr. Werner Fasslabend, former Austrian Minister of Defence (1990-2000), described the demographic challenges raised by population developments in Eurasia, China, India and Africa, saying they will eventually far surpass our current migration challenges. He thus underlined the role of a Eurasian-European cooperation to secure peace and stability in the region and the world. Showing a series of vivid maps, he pointed to the progress of conflicts along certain lines of development in the world in the last five years, and concluded with comments on the positive aspects of Russia’s intervention in Syria to mobilize greater support against ISIS and other terrorist forces. Dr. Elena Ananieva, the Director of the Center of British Studies of the Institute of Europe at the Russian Academy of Sciences, praised UPF for initiating a dialogue at a time when the ideal of dialogue itself was dismissed as weakness. She said a subjective approach to foreign affairs based on personal diplomacy could not replace an objective appreciation of national interests and objective tendencies to help predict and deal with conflicts. The West was not informed enough of the objective situation of Russia and Russian people after the split of the Soviet Union, she said, and they ignored Russia’s interests and concerns for its security. Today, she concluded, as Europe is faced with many challenges and the balance of power is shifting toward Asia, Eurasia becomes a strategic center that Europe cannot but deal with. Dr. Helge Lurås, the Director of the Centre for International and Strategic Analysis in Oslo, Norway, said that although Russia and Norway have mostly been in good relations in recent decades, Russia was still considered a dominant issue of security in Norway and a large majority of Norwegian people distrusted President Putin’s intentions. In great part, he explained, that was a remnant of a Cold War mindset. However, migration issues will change the European value system that partly justified this antagonism toward Russia and we will evolve toward a compromise with Russia. A rapprochement between Russia and Europe will face challenges, however, as some forces in the West, particularly in the United States, will likely interfere with the process of Eurasian integration. Dr. Andrea Giannotti, the Co-founder and Executive Director of the Institute for Eurasian Studies in Pisa, Italy, spoke on the historical roots of Europe’s “russophobia”, echoing President Putin’s view that “Western partners are benevolent towards Russia only when it is weak”. He then reviewed some of the benefits Europe could find in Eurasian integration, and outlined common security challenges faced by both regions: drug trafficking, piracy, the rise of radical Islamism or terrorism. In the community of mega-powers like the USA, Brazil, India or China, he concluded, stronger cooperation with Eurasia would strengthen Europe’s position on the long term. Before the afternoon session, a beautiful and moving musical performance by three artists from Kiev, Donetsk and St Petersburg – three regions in bitter conflict in Eurasia - enchanted the audience with traditional songs from Ukraine and Russia accompanied on violin and piano. 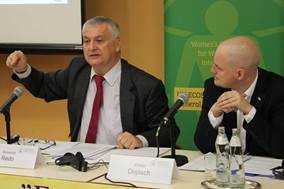 Dr. Walther Lichem, former Director of the Department of International Organizations of the Austrian Foreign Ministry and moderator of the third session, introducing the theme of the third session: “Interreligious & Intercultural Dialogue – Bridging Divisions between East and West”, and referring to Karl Jaspers, commented on the current need to “societalize” and relativize absolute truth in the context of diverse communities. Mr. Christian Rathner, Journalist at the Department of Religion of the Austrian National Television, in artful manner began to tell stories of historical cultural interplay between Russia and Europe, from Russian masterpieces being played in Viennese theaters to Beethoven’s Fifth Symphony being dedicated to a Russian patron of the arts, but also stories of underlying distrust and prejudice. Prejudice comes together with fear, he said, deploring that fear serves to maintain political order and still, to some extent, influences current world affairs. He spoke of the importance of interreligious dialogue to open up horizons, reminding that we are all bound together and that “attacking others is attacking oneself”. Dr. Vladimer Narsia, a Professor of religion at Georgia American University in Tbilisi, Georgia, began by challenging Russian views on the triggering of the 2008 border conflict with Russia. 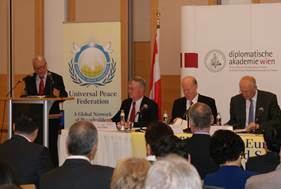 He then spoke about the role of interreligious education in a multicultural society, based on the Georgian example. He criticized both religious education in post-independence Georgia that focused on one dominant religion as a source of national identity, and the policy adopted in 2005 prohibiting the teaching of religion in public schools under the pretext of democratic principles. Pointing to the difference between religious indoctrination and interreligious education, he explained the importance of the latter in terms of national security and social stability: fostering dialogue and tolerance, challenging the roots of religious extremism, and promoting the moral development of youth. Mr. Marat Hayretdinov, the Director of the Department of Science and Education at the Muslim Spiritual Authority of the Russian Federation, challenged the claim that multiculturalism completely failed, but recognized it could not prevent the current rise of interreligious and interethnic violence. A main issue, in his view, was the quality of religious education. He criticized attempts by politicians to “modernize” some Islamic traditions, which brought a reverse effect and led to a rise in extremism, as in Tunisia. He saw two fundamental challenges in current Muslim education: the trend by some Muslim educators to focus on theology while neglecting secular sciences – in total contradiction with the practice of great Muslim scholars like Avicenna; and the need to focus on Islamic teachings fostering dialogue and peaceful coexistence with other religions, as testified by numerous passages in the Koran and Hadiths. Mr. Sandor Habsburg-Lothringen told the audience that, as a descendant of Empress Maria Teresa, Catherine the Great and Queen Victoria, his royal ancestry embraced both Europe and Russia. He recalled the unique blending of nationalities, cultures and religions in the Austrian-Hungarian Empire, and the founding moment for modern Europe that represented the 1815 Congress of Vienna. 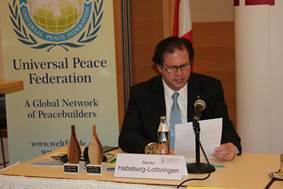 He then introduced his wife Margarete Habsburg, who shared about the Flame of Peace, and award given to individuals or organizations dedicated to the work of peace and reconciliation. The couple then offered on stage the wooden and stone award, meaning courage and endurance, to two participants: Dr. Elena Ananieva from Russia and Dr. Walther Lichem from Austria, representing Eurasia and Europe. The theme of the last session, moderated by Mrs. Yoshiko Pammer, was: “Engaging women and youth to fulfil Sustainable Development Goals: Education and Leadership”. Mrs. Marina Pilshikova, the Vice-president of the Congress of Ethnic Associations of Russia, spoke of the need in today’s society for the specific feminine ability for understanding and for compassion toward others. She explained about the Russian government’s policy to support traditional families. Family laws, she said, serve the state better then formal laws. On the grassroots level as well, women play a key role in cultural education in Russia, a country with over 180 nationalities. They lead various programs and festivals supporting family values and national cultures. Many also play an important role as teachers in schools, where parental care is an essential aspect of school education, and nourishing the soul is as important as providing knowledge. Mrs. Mariana Marin, the President of the General Association of Teachers of Moldova, reflected on the “social autism” created by the rise of individualism and the lacking of communication in society. Priority should be given to education, she said. She described her country’s strategy for educational development till 2020, setting the educational priorities of access, relevance and quality, and the new curriculums they are developing in line with European standards. She shared about the Teachers Association activities, notably in the conflict zone of Transnistria where two national cultures, even different alphabets (Romanian and Cyrillic) have to be dealt with. She introduced their active pedagogical work in collaboration with other countries in the region. 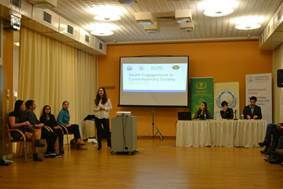 Mrs. Yuliya Vlasova, a Masters student at the Lomonosov Moscow State University of Fine Chemical Technologies, an active member of the Movement “Green University” and founder of the environmental movement “Pure Land”, described the vicious circle of mistrust, fear, and weapons which brings humanity toward self-destruction. Disarmament, she concluded, is the only path to be taken. Mr. Matteo Bergamini, the 23 year old Founder and Director of Shout Out UK, an independent news and media company in the United Kingdom, said that young people do not relate to Sustainable Development Goals because they do not associate with the UN or with political life. In 2005, less than 40% of young people voted at elections. We don’t understand politics, he said, because we have not gone through the political struggles our parents have. It is not a lack of will, but a lack of education and empowerment. Shout Out UK promotes political literacy through school courses and fosters empowerment by organizing youth debates. Earlier this year he launched the first Youth Leaders’ debate in Britain in collaboration with two local TV channels, which was the most viewed program yet by youth this year. Thus we give tools, he said, for fulfilling the UN agenda of sustainable development. 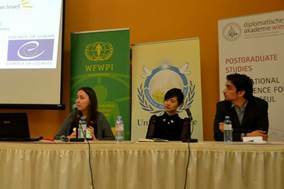 Ms. Gulnara Iusupova, a Masters student in International Relations at St. Petersburg State University, stated that youth played a leading role in developing or reviving trust among nations, when economic or political ties were low. She shared about student exchange programs and university environments where many social or political issues were discussed in international settings, opening young people’s minds to other views; about youth political forums such at the Youth UN model, where each participant must represent a country different from his or her own – a model that elder politicians could learn from as well, she commented; about volunteering in international events such as the Olympic Games, where partnership and humanitarian principles can be learned. 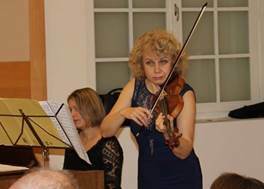 On Saturday October 31st, the morning session was held in the “Music Room” of the Diplomatic Academy of Vienna, chaired by WFWP-Europe President Carolyn Handschin. 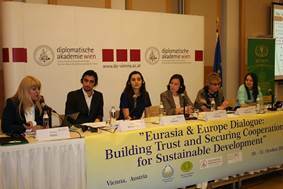 Three panelists discussed the theme of “Implications of the Post-2015 Sustainable Development Goals for Europe and Eurasia”. 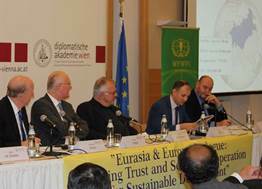 Dr. Slawomir Redo, Senior Program Advisor at ACUNS Vienna, spoke on local self-governance as a factor of peace and sustainable development. His reflection was based on research about social attitudes toward democracy in Poland, his native country. Social democratic capital, research shows, is higher in the part of Poland that historically was under Austrian imperial administration in the 19th century, in comparison to other regions that were under Prussian and Russian rule: local self-governance was a specific system of administration established by the Austrian Empire. Analyzing current levels of trust in the police in 26 European countries, he concluded that re-aligning responsibilities between central and local governments was essential to satisfy the requirement of shared responsibility and shared prosperity in the UN agenda for sustainable development. Dr. Yuriy Boshytskyi, Rector of the Kyiv University of Law of the National Academy of Sciences of Ukraine, introduced facts and data about his war-torn country since knowledge, he said, was the base for accurate perception and right decisions. A major European nation by its size, population, mineral and agricultural resources, Ukraine is also the birthplace of 7 Noble Prize winners. But how to speak of sustainable development in a country afflicted by war, with thousands of victims and a war budget hindering national efforts toward education, humanitarian relief or road infrastructure? Early 2015 the Ukrainian president issued a decree on sustainable development emphasizing development, security, responsibility and dignity. As a university rector, Dr Boshystskyi pleaded for building a platform of education where young people would be at the center of sustainable development, recommending academic exchange, friendship networks, cultural programs and publications on SDGs. Dr. Philipp Depisch, president of the Middle European Initiative, spoke about his organization’s objective to be a platform for dialogue between Ukrainians from both sides of the conflict, as well and Russians and Europeans. 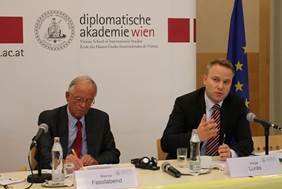 Having had conferences on the Ukrainian issue in 2012 and 2014, he shared his experience of the misjudgments such a position of mediator can attract, yet reasserted that Austria, with its background as a neutral nation, had a unique role to play in the conflict between Europe and Russia, and Russia and Ukraine. 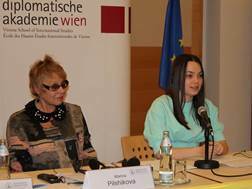 Ms. Elena Kolesnichenko, Chairperson of the UPF Youth Peace Council in Russia, shared her reflections on a future world of peace, justice, equality and dignity, and on the role young people expect to play in building it. To foster sustainable development, she said, a global partnership needs to be developed, involving young people in decision making. Drawing from her experience in humanitarian activities, she emphasized the need for a vision and for solutions that come from the heart. How can a state assure the security of its citizens, she said, if one does not care for one’s own neighbor? 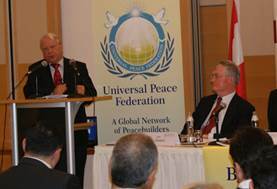 Mr. Jack Corley, President of UPF-Europe, then spoke about the 15 years he spent in Russia and the former Soviet Union, from his base in Moscow. He recalled his experiences at the time of transition between the Soviet and post-Soviet era at the beginning of the 1990’s, saying Westerners should give more credit to Russians and former Soviet citizens themselves for this peaceful transition and for the challenges they faced to transform their society. Democracy in the West did not come easily, he said. Core values of freedom and equality should certainly be learned, but not everything from today’s liberal democracies should be copied. He then went on to introduce some of the projects UPF is developing in Europe, from conferences promoting the family to youth programs or consultations with political leaders at the UN in Geneva and Vienna or the British Parliament. Dr. Thomas Walsh, president of UPF International, gave a final reflection on two historical trends toward universalism and toward particularism that simultaneously affect societies in our time. In the religious sphere, one sees tendencies toward sectarian identities and extremism, while at the same time interreligious dialogue is increasingly recognized. In the sphere of political governance, one sees a resurgence of nationalistic identities while the rise of globalization challenges the limits of the centuries-old Westphalian system of nation-states. Transnational tendencies foster the development of regional entities like the EU or the EEU, or the UN itself. Many people today identify with a broader spirituality that does not replace but complements their religious roots. The Sustainable Development Goals themselves are transnational goals, and all governments increasingly recognize the influence of NGOs and civil society. 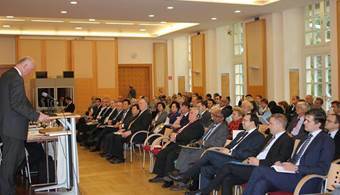 Particularly, he concluded, around the world faith-based organizations are becoming a major factor in world affairs. 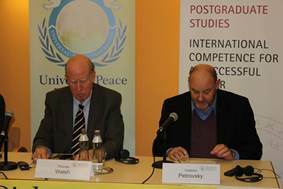 The session ended with the reading by Dr Vladimir Petrovsky, an academic Advisor to UPF-Eurasia who had spoken in the first panel, of a statement from conference participants representing the result of speeches and discussions, calling for dialogue and new start in relations between the countries and peoples of Europe and Eurasia. 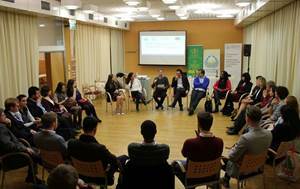 Youth Working Group: "Youth Engagement in Contemporary Society"